Thermoset or Phenolic (Bakelite) - These caps are known for providing the widest range of chemical compatibility and for being the most temperature tolerant of plastic closures. They also provide the most consistent adherence to close dimensional tolerances. Ideal for pharmaceutical applications. 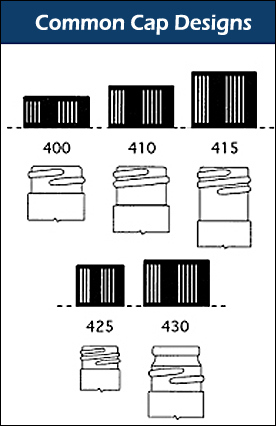 Thermoset closures cannot be remelted after they are formed. Common resins include urea, phenolic, and melamine. Metal - Metal caps offer the widest range of temperature tolerances and are very resistant to fracture from impact. Metal caps are great for industrial and food applications. A metal closure is manufactured from either steel (coated with anti-corrosive coating of either chromeplate or tinplate) or aluminum. Polypropylene (Thermoplastic) - Polypropylene caps are known for good impact strength, cost effectiveness, and pliability. They can be remelted after they are formed.